Christian Fredrick, or C.F. Martin was born in Markneukirchen Germany in 1796 and descended from a long line of woodworkers and cabinet makers. He became apprenticed to another man by the name of Johann Stauffer, a well known guitar-maker at that time, and after completing his training returned home to his native Germany and opened his own guitar shop. C.F. Was soon immersed in a controversy that had been raging for some time between woodworkers like himself and violin makers who sought fervently to maintain the rights to produce all musical instruments exclusively. Although craftsmen upheld the rights to produce guitars, Christian Fredrick Martin decided that the current political air surrounding the production of guitars was too restrictive and he opted to set up his luthier business in New York City in 1833. Five years later, he relocated once again to Nazareth Pennsylvania where the Martin headquarters remain to this day. The body class for the exquisite Martin M-36 falls under the category of what Martin refers to as the "M" class, or 0000 and is also referred to by Martin as the "Grand Auditorium". This body style is slightly smaller than the dreadnought models but larger than the 000 or OM body styles. The body measures 16" wide, 20" long and 4" deep. The top of the guitar is composed of Sitka Spruce which has the effect of producing lighter tones when the guitar is strummed. 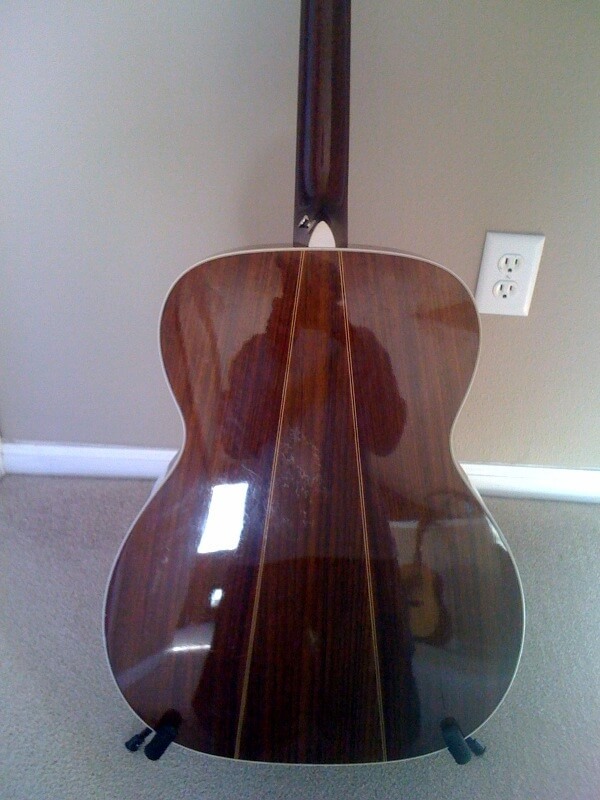 This effect is mitigated by the three-piece back which is composed of East Indian Rosewood and seems to impart an increased bass response, especially when compared to Martin's "D" series. The body is sealed with a polished gloss finish which allows good moisture transfer as the guitar ages and reduces the likelihood of neck hump. The M-36 has 20 frets, 14 of which are clear of the body and the fretboard itself is composed of solid black ebony which aside from being one of the most dense woods in the world (it's actually one of the few woods that will sink in water) it's also very beautiful. The width of the fingerboard at the nut is 1 and 11/16" while mother-of-pearl position inlays populate the fretboard. The M-36 also boasts the use of Gotoh chrome tuning machines which are sealed tuners utilizing a 16 to 1 ratio. This type of tuner produces a steadier tone and will allow less slippage over its open counterparts making tuning easier and more reliable over time. Most of the components of the Martin M-36 are hand assembled, and between the superlative materials utilized and the craftsmanship that go into its production the guitar is well worth the money. The Martin M-36 is currently available for anywhere between $2,300 and $2,600 and can be found both in music stores as well as on-line. And although the sticker price is relatively high for this model, its composition as well as its namesake certainly validate the expenditure. The Martin M-36 is a delight to gaze upon, and a joy to play. 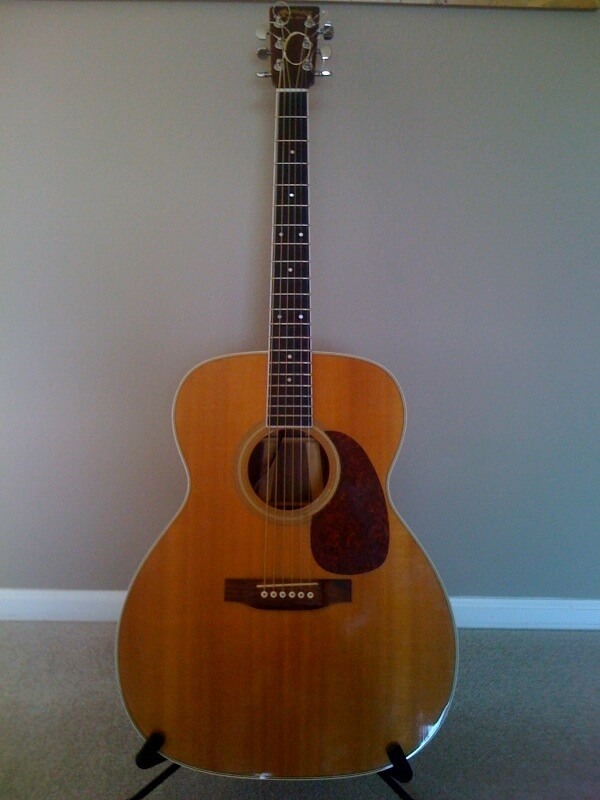 From the first time I picked it up I knew it was unlike any acoustic guitar that I had ever held. It has a light yet balanced feel that seems to simply mold into your body. 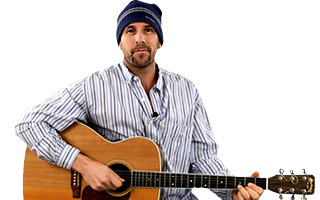 Strumming seems effortless and the flawless action makes playing painless, from the first fret to the fourteenth. Even with longer periods of playtime, neither my hands nor my fingers experienced any discomfort. And as mentioned previously, the M-36 has a greater bass response than most other Martins and subsequently fills the performance space with a broader spectrum of sound. 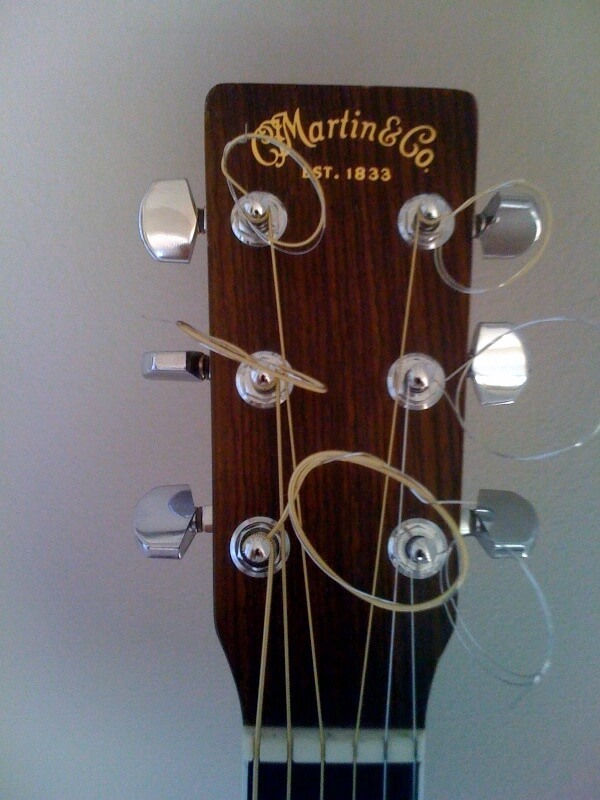 The Martin M-36 makes playing arpeggiated triplets as easy as a simple descending scale.